"The Ultimate BMW Experience” will include a behind-the-scenes guided walk through the plant. 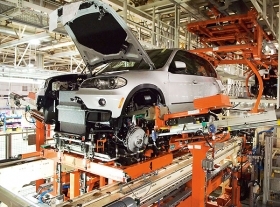 BMW has been welcoming visitors and tourists into its Spartanburg, S.C. assembly plant since the 1990s. But it now plans to offer a more upscale factory visit -- for $99 a head. “The Ultimate BMW Experience” -- a reservation-only, three-day-a-week factory tour package -- will include a behind-the-scenes guided walk through the plant, a tour of the plant's on-site Zentrum museum and theater, and a two-hour driving experience at its Performance Center driving school across the street. Spartanburg already charges $7 per person to take a tour into limited areas of the plant, which builds the X5 and X6 models. Drop-ins can tour the Zentrum free of charge. The plant hosts about 30,000 visitors a year, according to plant spokeswoman Bunny Richardson. The new tours will provide a concierge who takes guests into previously restricted areas, like the paint shop and the door line. Richardson says the staff will tailor a tour for premium visitors; plan the event around speakers, receptions and catered meals; and even provide cars with pre-determined driving routes around the region.